(Bloomberg) -- There are finally enough signs of an emerging pork catastrophe in China to propel prices and get funds to turn bullish again. African swine fever, which is highly lethal to pigs and difficult to contain, was first reported in China last August. It’s taken time for the disaster to play out, but it’s arrived. Pork prices in the Asian nation have shot up, and the Chinese government said its sow breeding herd was down about 15 percent. That decline is bigger than the entire herd of North America. Earlier this month, China made its third-biggest weekly purchase of pork from the U.S. ever, and on Thursday the pace of exports increased despite a massive tariff. The U.S. Department of Agriculture expects total Chinese pork imports to jump 28 percent. Futures have skyrocketed, with the most-active June contract up 26 percent in March to the highest since it started trading in late 2017. 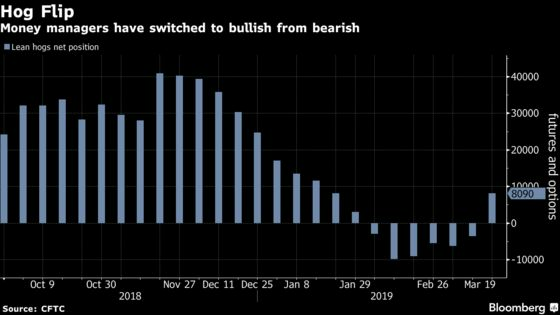 Money managers have flipped back to bullish from bearish on hogs as long positions outnumbered short ones by 8,090, weekly U.S. Commodity Futures Trading Commission data on futures and options show. Holdings had been net-short by 3,633 positions a week earlier. Helping fuel the rally is the notion that hog casualties in China are probably bigger than what’s been officially reported by the government. Vietnam reported its first cases in February, and has already reported nearly double the number of Chinese cases. China has many times the animals, and the disease has been spreading for months throughout the nation. A hole in Chinese production of say 20 percent means there won’t be enough pork in the world and prices will have to “increase significantly” in order to ration out supplies, said Altin Kalo, an analyst at Manchester, New Hampshire-based Steiner Consulting Group. Even if China starts to buy more pork from the European Union or Canada, other importers relying on those countries’ supplies eventually may end up at U.S. producers’ doors. There are still unknowns that could hamper the rally, and add even more volatility to a market that’s swinging wildly. While there’s little doubt that African swine fever is inflicting damage on China’s herd, there’s still the question of how much Chinese buying will materialize. Supplies are big in the U.S., and exports were hampered by trade tariffs. 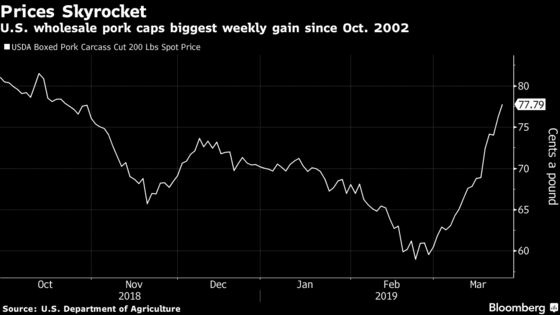 Markets may react if more purchases don’t show up in weekly trade data, said Will Sawyer, an animal protein economist at CoBank. Chinese buyers might go elsewhere, like to the EU, Canada or Brazil, before coming to the U.S., which would delay demand for U.S. pork. Politics will play a role, as a trade war continues between the U.S. and China. Consumers in the Asian nation may turn to other proteins like chicken.